Those familiar with the Ole Miss campus may notice some in-progress work in the Grove and Circle and wonder what is going on. Some have speculated on whether this work is a lighting project or a cell antenna project. Actually, it is both! 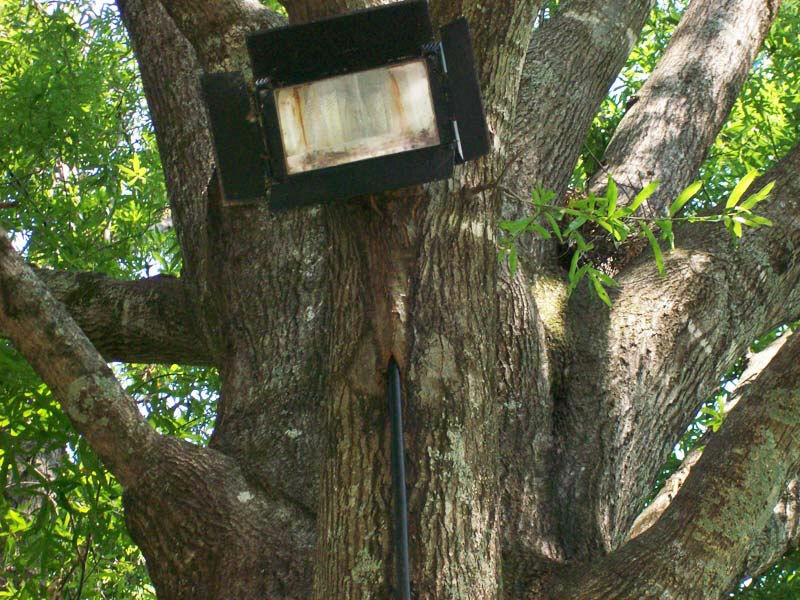 Current lighting within the Grove is provided through electric lamps that are installed in the tree canopy. This is becoming problematic as the trees grow around the electrical cords feeding the lights. The lighting on the perimeter of the Grove is currently provided by 70s era aluminum street lights, which are functional but not particularly attractive. The work that is taking place now will replace the perimeter lights with more attractive poles that fit with the setting. The new perimeter poles will be the same height as the current poles and will support banners like the current poles do. Smaller poles with a similar style will be added to the interiors of the Grove and Circle to eliminate the need for lighting up in the trees. 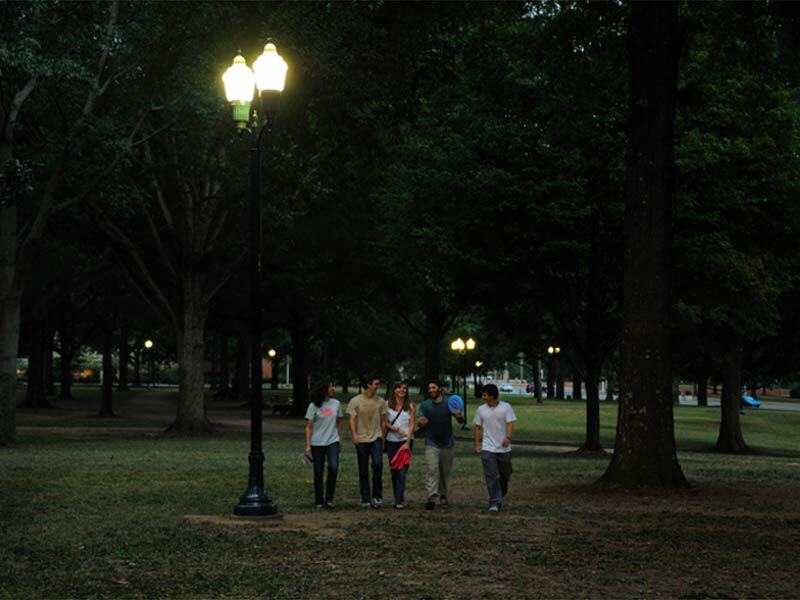 Dark sky compliant light fixtures are being utilized to avoid light pollution within the Grove and Circle. But, these poles serve another important purpose. They house stealth antenna making up a Distributed Antenna System or DAS. A DAS is a network of small antenna nodes that support high cellular bandwidth and capacity needs within a well-defined geographic area. These systems have been used with great success in malls, airports, and cruise ships, and now they are being deployed in major sports venues. The DAS will address cellular service, not Wi-Fi, but there is a possibility of adding more equipment to the poles in the future to provide Wi-Fi service outdoors. If you have tried to use your cell phone on a game day, chances are you experienced less than satisfactory service. Last year, Ole Miss contracted with a company called NextG Networks to build a vendor-neutral DAS for improving cell coverage. NextG’s first university customer was Notre Dame. Others include the University of Texas, Oklahoma University, and the University of Southern California. The first cell phone vendor to participate in the Ole Miss DAS is AT&T. The first phase of the DAS includes the Vaught-Hemingway Stadium, the Grove and Circle, the Ford Center, and the Holman / Conner complex. All of these areas except for the Grove and Circle will be functional by early September. 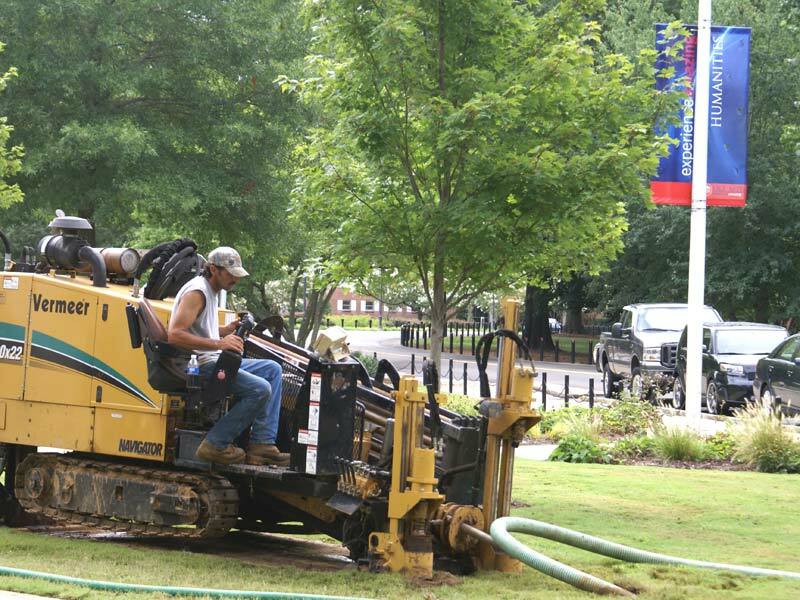 The Grove and Circle areas will be functional later in the fall semester. The longer timeline is needed for the Grove and Circle due to the extreme care that is being taken in these beloved spaces. 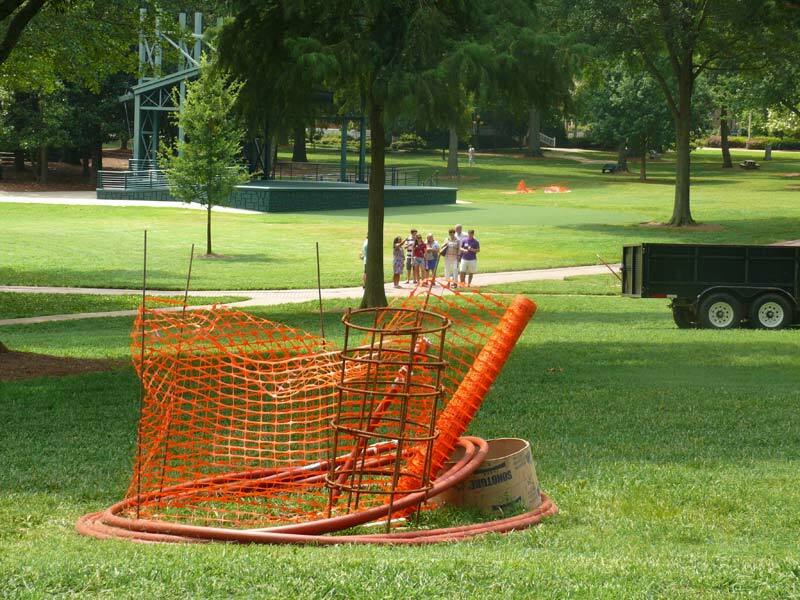 The project contractors are working closely with the UM Landscape Services Department to avoid causing any damage to the trees in the Grove and Circle. For example, these areas are being bored rather than trenched, and much of the work is being carried out by hand rather than with machines to minimize the risk of any damage. The next few months will be exciting as the lighting project moves forward and the DAS goes live. Visit this website for news and updates. Please send any comments or suggestions to it@olemiss.edu. Grove at Night: All work is finished. A Finished Installation: When everything is finished, the new Grove light poles are handsome additions. Heavy Lifting: Once all the electronics are connected, it's time to mount the pole to the concrete base. Good Supervision: DAS Project Lead Mary Robinson oversees every aspect of the operation. Technology: As both an outdoor light and a cellular antenna, each pole requires both regular power and advanced electronics. 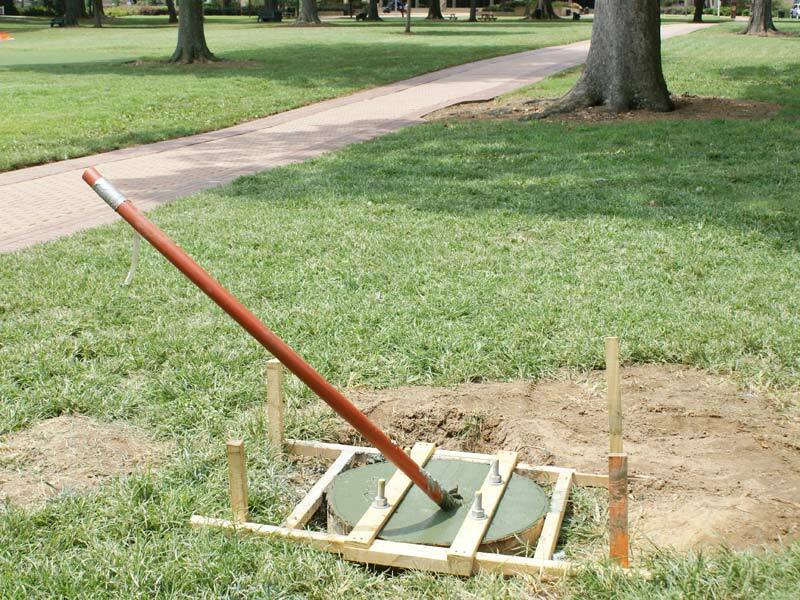 Better for Trees: Boring holes is much less damaging to tree roots than digging trenches. Minimal Disruption: Work is scheduled to provide the least amount of disruption. New Lighting: The Grove and Circle will be illuminated without disturbing the trees. 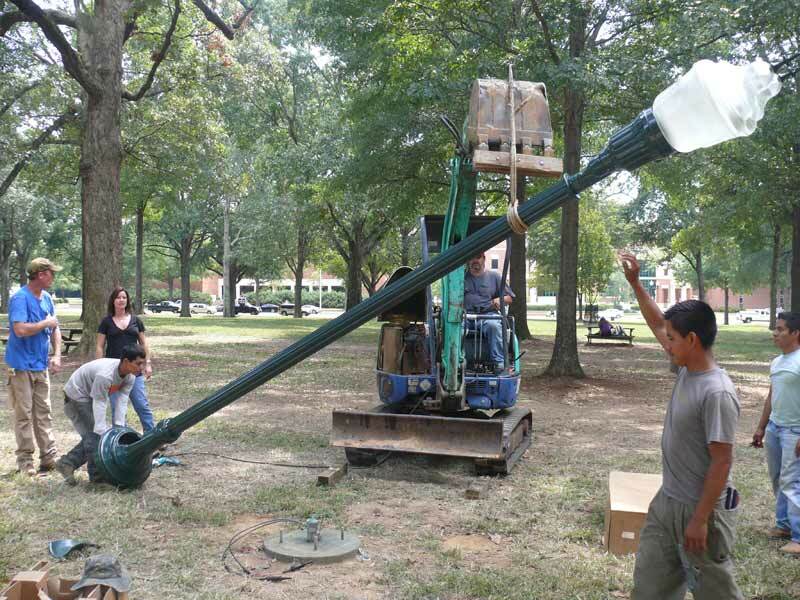 Stadium Antenna: Expanding cellular coverage for Vaught-Hemingway stadium. 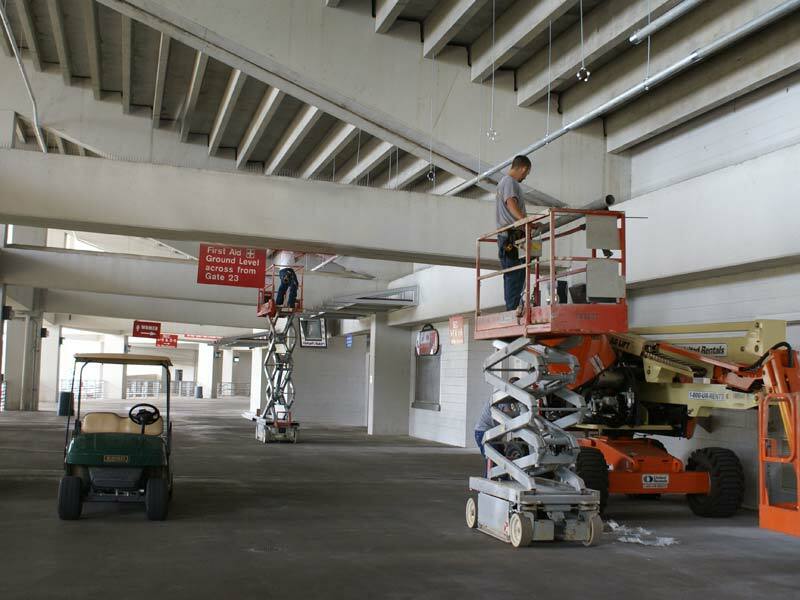 University Avenue: Workers install base hardware for new fixtures. Existing Grove Lighting: Electric lamps, which were originally installed into the tree canopy, have become overgrown by the trees themselves. 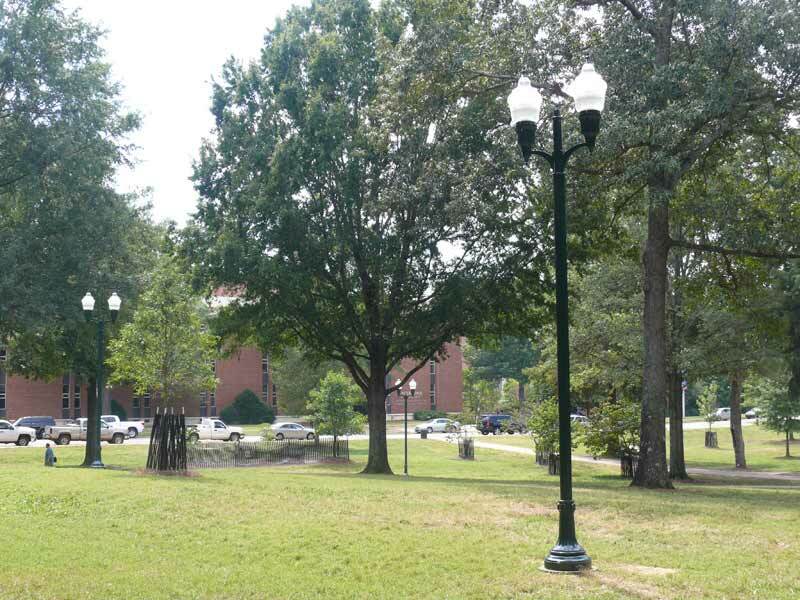 Current Perimeter Lighting: New poles will replace these around the Grove and Circle. November 17, 2011:The DAS covering the Grove, the Circle, Holman/Conner, the Stadium, and the Ford Center is working at 100%. All construction is complete. 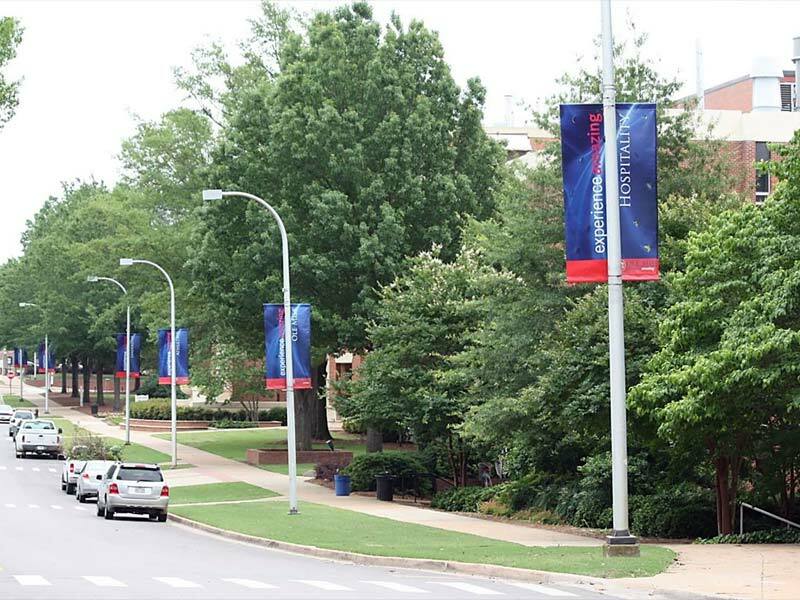 Facilities Planning is researching options for mounting the banners on the double fixture light poles in the future. October 13: Four perimeter poles will go live this weekend. AT&T cellular service will be improved for Saturday's game (Oct. 15), but it still won't be 100% yet. September 14: The inner Grove lights are up and will be lit tonight! Construction to pour bases and start setting poles for the outer Grove and the Circle will begin Sept. 26 with a three week window between home games. Performance of the cellular system will require several weeks of monitoring and fine tuning before it will be 100% operational. August 19: All underground boring piping has been installed inside and around the Grove and Circle. 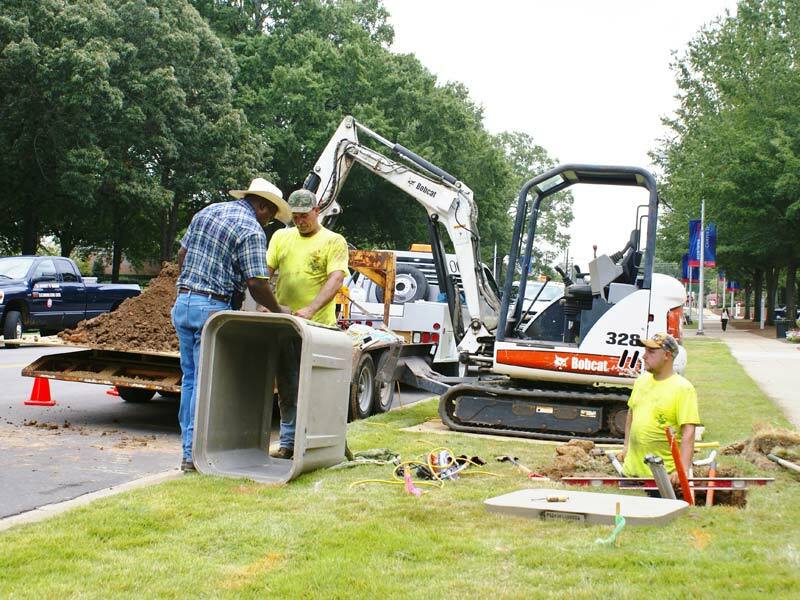 Delivery and installation for inner Grove poles is scheduled for next week. Stadium antennas will also be tested and optimized next week. The stadium DAS site is scheduled to be operational by the first home game. Oct. 13: Four perimeter poles to go live this weekend. 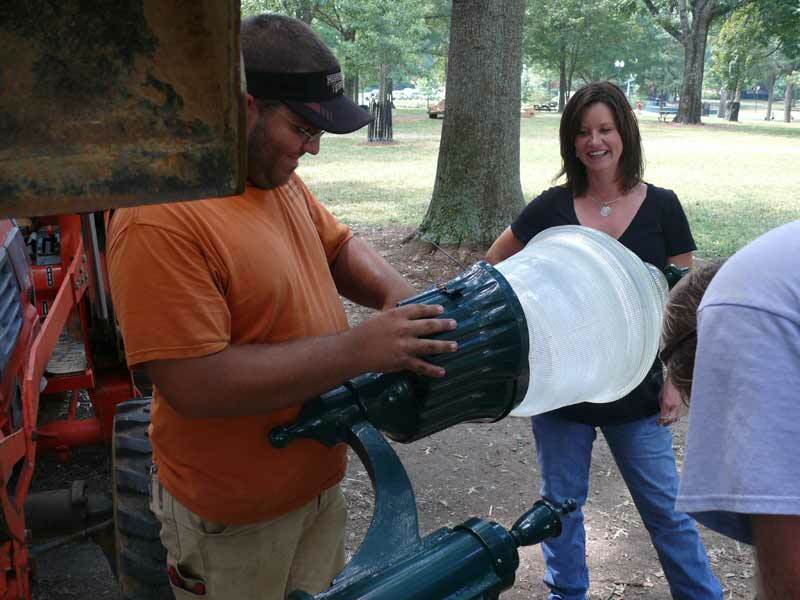 Sept. 14: Inner Grove lights will be lit tonight! Aug. 19: Boring inside and around Grove completed. July 27: Boring began in the Grove. May 2, 2011: Stadium construction began. Underground boring took place in July and August to prepare for the electrical and communications infrastructure supporting the lights and DAS. There will be a total of 17 interior poles and 32 perimeter poles. The initial AT&T DAS deployment will include 7 perimeter street lights and 2 interior lights. Installation of the perimeter poles will take place in two phases with the first phase being scheduled for completion on Friday, October 14 and the second phase on Friday, November 11. 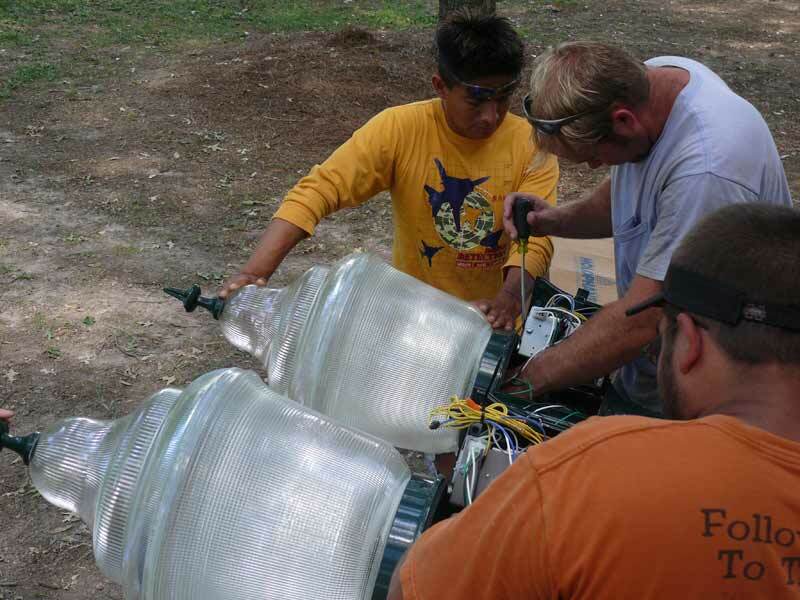 Dark sky compliant light fixtures are being utilized to avoid light pollution in the Grove and Circle. The DAS design supports the addition of more cell phone vendors in the future.